Announcing the cast of THE BEST CHRISTMAS PAGEANT EVER! The Rose Theater announces the cast of its holiday production, The Best Christmas Pageant Ever: The Musical, a musical adaptation by Jahnna Beecham and Malcolm Hillgartner, based on the 1971 children’s book by Barbara Robinson. The show will run December 1-23, 2017 on The Rose mainstage. Everyone in town knows the Herdmans are a family of rotten children — delinquents who lie, steal, swear, fight, light things on fire and smoke cigars. They are the bane of the community. Unfortunately for the “good” kids, the Herdmans hear that free snacks are offered at the local Sunday School and they show up for the auditions for the Christmas pageant. Several Rose students — and a couple of newcomers — take on the roles of the Herdman children in the upcoming Rose production. Making their Rose debuts are Kaeli Vondra (as Imogene Herdman) and Luke Nieland (as Leroy Herdman). The remaining Herdman siblings will be played by Rose students Chase Robinson (as Gladys), Wayne Hudson (as Ralph), Josiah Hydeen (as Claude) and Jonas Caruso (as Ollie). Once they learn about the Christmas pageant, the Herdmans insist on playing all the good parts and taking over the rehearsals. With the Herdmans ruling the roost — even though they have never even heard the Christmas story — everyone from the terrified pint-sized shepherds to the furious church ladies are calling for the pageant to be called off entirely. The Herdmans insist on telling their own versions of the story, which include hunting down the evil King Herod (who is not supposed to be in the show) with the battle cry of, “Did, Herod, Die!” They loudly communicate their frustrations and disgust with the characters in the Christmas story — from the Innkeeper who made the pregnant Mary sleep in the barn, to the Three Kings who brought completely impractical gifts to the new baby Jesus. When the pageant’s usual director, Helen Armstrong (played by Theresa Sindelar), is sidelined with a broken leg, it falls to the reluctant director Grace Bradley (played by Sarah Gibson) and the Reverend (played by Kabin Thomas) to help their community see the Christmas story — and the Herdman kids — through new eyes. Bob Bradley (played by Dan Chevalier) does his best to stand by his wife, through the thick and thin of the pageant rehearsals. Every kid at Lincoln Elementary knows to stay far away from the Herdman kids, lest they “pound you ‘til your face is black and blue.” Several youth actors, ranging in age from 9 to 16, give life to the small town community. The Bradley children, Beth and Charlie (played by Lily Weak and Carson Bishop, respectively) try to soldier on in support of their mother-turned-director, but have their share of pre-teen mortifying mom moments. Annabella Mosher plays Alice, a snarky, tattle-telling, know-it-all poor sport. Other youth cast members include Chloe Irwin, Mason Lindsey, Kian Roblin, Hayden Blayney, Briana Nash and Phoenix Nehls. Church busybodies are not shy to offer their opinons of the ongoing pageant mayhem — and sometimes get sucked into the chaos themselves. Jennifer Gilg, Marguerite Bennett, Robby Stone and Ashley Laverty complete the small town community. In the end, what some folks feared would be the worst pageant ever turns out to have a special quality that makes everyone rethink the real meaning of the Christmas story. The Best Christmas Pageant Ever runs December 1-23, 2017, with performances on Fridays at 7 pm, Saturdays at 2 pm, select Saturdays at 7 pm, and Sundays at 2 pm. The 2 pm show on Saturday, December 16 will be interpreted for people who are deaf or hard of hearing; this show will also include audio description services for audience members who are blind. Contact The Rose Box Office at (402) 345-4849 for more information. 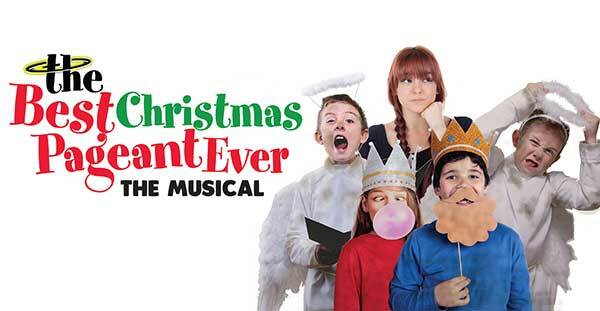 Tickets for The Best Christmas Pageant Ever are $27 for main floor and $22 for balcony. Discount ticket vouchers are available at all area Hy-Vee stores for $22. Members of The Rose receive discounted tickets to the production. The Best Christmas Pageant Ever is sponsored by Children’s Hospital & Medical Center, Nebraska Furniture Mart, Hy-Vee, Omaha Steaks, the Nebraska Arts Council and the Nebraska Cultural Endowment. Special opening night activities, including live reindeer and a visit from Santa, are sponsored by Kiewit Companies.